What we really need is a new women's health movement, one that's sharp and skeptical enough to ask all the hard questions: What are the environmental (or possibly life-style) causes of the breast cancer epidemic? Why are existing treatments like chemotherapy so toxic and heavy-handed? And, if the old narrative of cancer's progression from "early" to "late" stages no longer holds, what is the course of this disease (or diseases)? What we don't need, no matter how pretty and pink, is a ladies' auxiliary to the cancer-industrial complex. in the course of a photo gig for a local non-profit health group, i'm encountering some interesting body art. 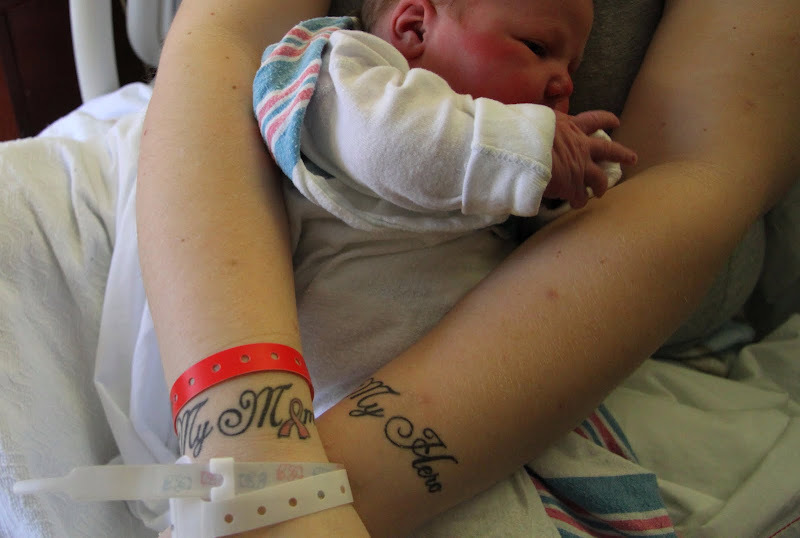 today's featured tattoos are on the wrists of a young woman who had the day before given birth to a beautiful and healthy baby girl. the new mother graciously allowed me to add images of her tats to my body art catalog. she also shared the backstory - simply said the tattoos are a tribute to her mother a breast cancer survivor. women's health is once again in the news - alas, to me this is just one more skirmish in the never-ending battle over the control of women's bodies. again the susan g. komen foundation (sgk) is at the center of controversy and for some of us just criticism. fortunately, the powerful backlash sgk suffered from its decision to cut funding to planned parenthood for mammograms led the organization to reverse its decision and continue funding breast health services at planned parenthood. the other day i heard about pink ribbons inc., a new documentary which seeks to tell the real story behind the ubiquitous pink ribbons. Love that photo kimy! My neice is celebrating her first year "cancer free". I'll send her a link to this post. This story (the sgk story) has even spread across the Atlantic and the way things are going I wouldn't be surprised if some of the attitudes that brought about their initial decision aren't crossing the pond too. It is sad that such battles still have to be fought. beautiful photo . . .